Adult male wild turkeys are very large and dark with a bare, red and blue head, with red wattles on the throat and neck. Length: 48 inches (tip of bill to tip of tail). Female wild turkeys (hens) are smaller and less iridescent than males. After mating, the females care for the young alone. A popular gamebird, the wild turkey is found in mixed forests and grasslands statewide. Successful management of wild turkey populations focuses on proper seasonal combinations of food, cover, and water. Young turkey and other fowl are called poults. Video of a wild turkey. Male wild turkeys make a gobbling sound, especially during mating season in the spring. A popular gamebird, the wild turkey is found in mixed forests and grasslands statewide. Like other ground nesters, their reproductive success may be greatly reduced by extensive precipitation at nesting time. In the 1950s, populations in the state were at an all-time low of fewer than 2,500 birds in 31 counties; in 2004, hunters checked nearly 61,000 turkeys. Successful management focuses on proper seasonal combinations of food, cover, and water. Wild turkeys forage by scratching in the leaves beneath hedgerows and leafy areas in forests. Acorns are the most important food, particularly in winter, but grass seeds, dogwood fruits, wild grapes, corn, oats, and wheat are important, too. Young turkeys eat mainly insects, which provide greater protein for their rapid growth. 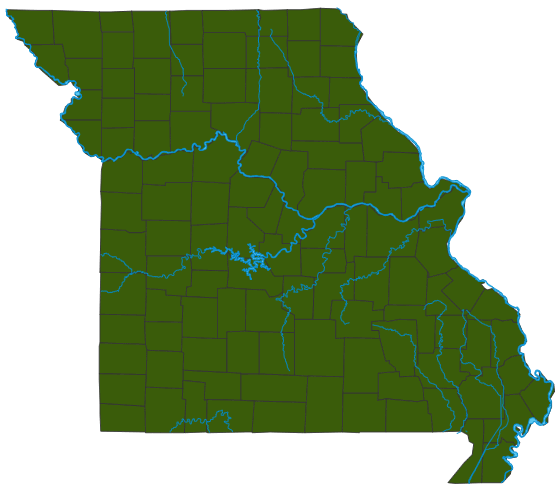 Statewide; most abundant in the Ozark Border, Glaciated Plains, and Ozark Natural Divisions. Uncommon permanent resident (rare in Osage Plains and in Mississippi Lowlands except along forested rivers). Turkeys flock in winter. In spring, male turkeys (toms) begin gobbling to announce themselves to males and to attract females. Males perform elaborate strutting displays for females, spreading their tails like a peacock and puffing out their feathers. After mating, females care for the young alone, creating shallow nests on the ground. They lay about 10–14 eggs over a period of days, then incubate them for about a month. The precocial young are able to leave the nest within a day of hatching. As one of the most popular gamebirds, turkeys are the main target of a large segment of the hunting industry. Humans are the turkey’s leading predator. Many animals feed on the eggs and young of wild turkeys, and several predators feed on adults as well as young. The turkeys, in turn, are steady grazers on seeds, nuts, insects, and other foods.